AGUA DE MAR CON XILITOL PARA UNA ACCIÓN BACTERIANA; LIMPIA Y PREVIENE LAS INFECCIONES BACTERIANAS. 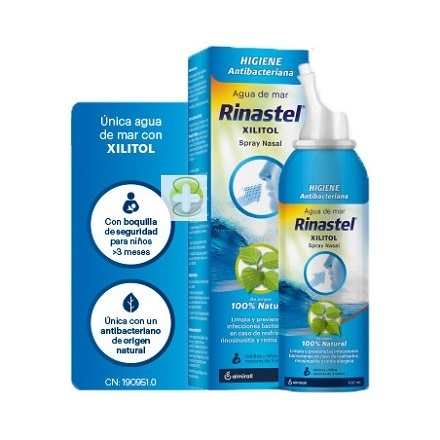 HIGIENE NASAL DIARIA EN ADULTOS Y NIÑOS MAYORES DE 3 MESES. MEJORA LOS SÍNTOMAS DE LA RINITIS ALÉRGICA Y ALIVIA LOS SÍNTOMAS DE RESFRIADOS EN COMBINACIÓN CON ORL. HUMIDIFICA Y LIMPIA LA MUCOSA NASAL. SE PUEDE USAR CON SEGURIDAD A DIARIO E INCLUSO VARIAS VECES AL DIA SI FUESE NECESARIO Y, DURANTE UN PERÍODO LARGO DE TIEMPO GRACIAS A SU COMPOSICIÓN NATURAL Y FISIOLÓGICA. SOLUCIÓN CON GAS PROPULSIVO INERTE (NITRÓGENO). SIN CONSERVANTES. PUEDE EXPLOTAR SI SE CALIENTA, ALEJAR DEL FUEGO, CHISPAS, LLAMAS, SUPERFICIES CALIENTES.